The conversion of an old patio between the garden and the house façade is a fantastic opportunity to rethink the use of exterior areas as proper open-air living room in Villa Leopoldina. 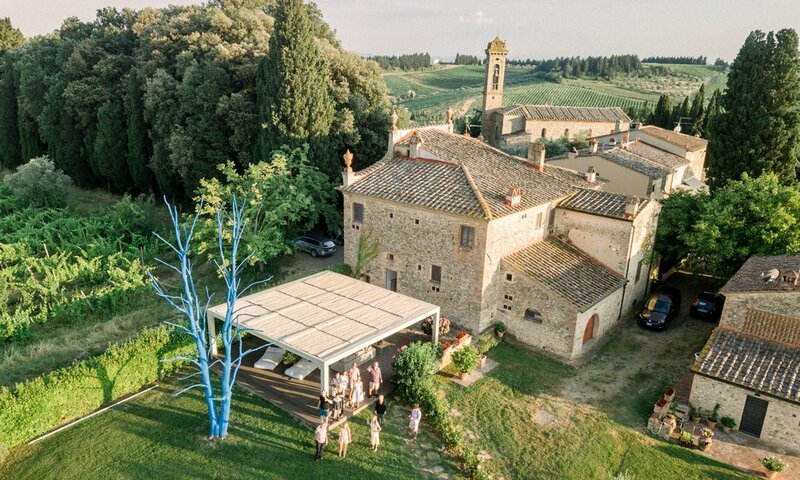 This space enables guests to enjoy a great gathering area arranged inside and around the patio, where the blue tree together with the landscape are most notable piece. All social activities take place in this patio with visual contact with the living room, a place filled with natural light and ventilation, extended to the exterior. Pavement is solved with a continuous wooden paving and the structure is contemporary, yet with an ancient atmosphere. Sofas, used by both sides, are the only separation between external spaces and home, the entire room provides privacy and relaxation. Grass, plants and trees all around generate a good feeling through its natural environment. Yoga sessions combine private, or group, classes in relaxation and meditation techniques and are held in the patio: our guests find this setting both stunning and therapeutic. This villa, located in Chianti, is composed by seven bedrooms, two living rooms, dining room and kitchen. The Villa is situated right in the heart of the Chianti area and from its windows it is possible to admire the picturesque Tuscan landscape, made up of green hills dotted with olive trees, thriving vineyards and centuries-old cypress trees.